Ultrasound (US) – Wayne Radiologists, P.A. You will be asked to lie down on the exam table and clear warm gel is applied to the area being examined. The technologist will gently press a small device across the skin and take images. The technologist will be viewing your images during the exam, however they are not permitted to discuss any findings during or after the exam. All images taken must be reviewed by a radiologist. Exam preparation varies depending on the type of exam ordered. You will be notified by your doctor of any prep when the exam is scheduled. If you have any questions you can call our office at 919-734-1866. Please wear comfortable, loose-fitting clothing. 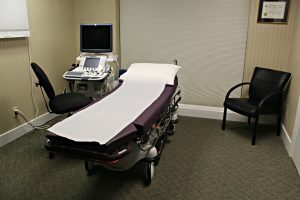 You must have an order from your doctor to schedule an appointment for an ultrasound. In most cases your doctor will schedule the appointment for you and will inform you of the appointment date, time and exam prep. If you have questions about your appointment or need to reschedule you can call our office directly at 919-734-1866.